Update: 31 August 2013 Getting a lot of WUWT visitors today! I've provided an update for them. Bob Tisdale is either as thick as a brick or a liar. You can read and comment here if you want to! By now most people who read climate denier blogs would be aware of the awful trouble poor little Anthony Watts has with anomalies. He is befuddled, bamboozled and betrayed by them over and over again. He's not the only one. However this time it's Bob Tisdale who wants to hide the rising global surface temperatures. He often gets up to tricks like this and this, but deniers are the only ones who are willing to fall for them. According to NOAA scientists, the globally averaged temperature for June 2013 tied with 2006 as the fifth warmest June since record keeping began in 1880. It also marked the 37th consecutive June and 340th consecutive month (more than 28 years) with a global temperature above the 20th century average. The last below-average June temperature was June 1976 and the last below-average temperature for any month was February 1985. First, the error: According to the NOAA Monthly Global (land and ocean combined into an anomaly) Index (°C), the “last below-average temperature for any month was” in reality was December 1984, not February 1985. Makes one wonder, if they can’t read a list of temperature anomalies, should we believe they can read thermometers? Being of a sceptical bent, especially when it comes to WUWT, I went to the NODC/NOAA website and downloaded the data for February and the data for December. The data I downloaded was not inconsistent with the NCDC report. 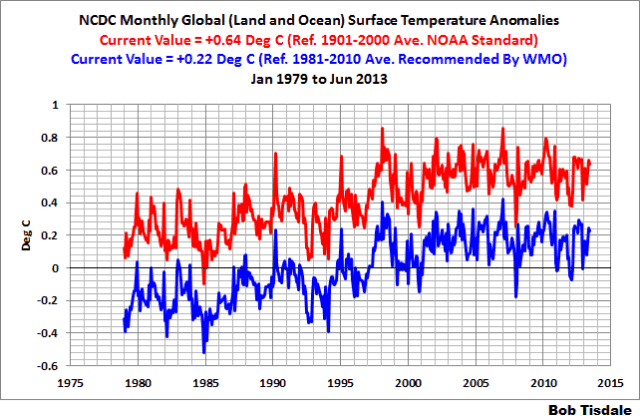 According to these data, the February 1985 anomaly from the 1901-2000 mean was zero while the December 1984 anomaly from the 1901-2000 mean was -0.1. Then I checked Bob's source. It happened to be measured to four decimal places. The February 1985 anomaly from the 1901-2000 mean was 0.0027 (ie zero to two decimal places) while the December 1984 anomaly was -0.0971 (or -0.1 to two decimal places). So one could argue that technically Bob was correct. However taking a temperature anomaly to four decimal places, or even three decimal places is cutting it fine. Fake skeptics are often quick to screech "error bars" except when they are looking at a denier chart. Nonetheless, February 1985 was not below average in either record. It was exactly average in the first source and above average in the second. I wonder if NCDC/NOAA had said that December 1984 was the last month "below average" would Bob have gone to my first source and claimed they should have referred to February 1985? Second, it’s very obvious that NOAA press releases have degraded to nothing but alarmist babble. Why does he say it's alarmist babble? Well, it's because they do a comparison with the twentieth century mean instead of the 1981-2010 mean. Bob even puts up a picture to show us the difference. Here it is - as always, you can click it to see the larger version if you want to. If the NCDC had revised their base years to comply with WMO recommendations, the press release wouldn’t have the same alarm-bell ring to it. According to NOAA scientists, the globally averaged temperature for June 2013 tied with 2006 as the fifth warmest June since record keeping began in 1880. It also marked the 17th consecutive June and 16th consecutive month (less than two years) with a global temperature above the 1981-2010 average. The last below-average June temperature was June 1996 and the last below-average temperature for any month was February 2012, though December 2012 was basically zero. Bob would just love to hide the incline. According to NOAA scientists, the globally averaged temperature for June 2013 tied with 2006 as the fifth warmest June since record keeping began in 1880. It also marked the 37th consecutive June and 340th consecutive month (more than 28 years) with a global temperature above the 20th century average. It also marked the 17th consecutive June and 16th consecutive month (less than two years) with a global temperature above the 1981-2010 average. The last below-average June temperature was June 1976 June 1996 and the last below-average temperature for any month was February 1985 February 2012, though December 2012 was basically zero. Bob Tisdale is trying to hide the temperature incline! Bob wants to "hide" the warming by shifting the baseline up! He doesn't want you to know that it's more than 340 months or more than 28 years since any monthly temperature was below the twentieth century average. No-one aged 28 years or younger has ever in their life experienced a year where the global average surface temperature was at or below the average for the entire twentieth century. No-one aged 37 years or younger has ever experienced a June that was colder than the average June temperature in the twentieth century. That's what Bob doesn't want his readers to know. Is Bob Tisdale trying to deceive people? Yes. He tries to deceive his readers into thinking that there has only been a couple of years of global warming. In the words of the IPCC - it is unequivocal! Think about this - are you a member of the privileged few? The chart on the right shows the percentage of people in the world today younger than particular ages in years. So 9% of people are younger than five years of age and 92% are younger than 65 years of age. Lets play the anomaly game like Bob did, but using years. It's seventeen (17) years since there was a year with an average global temperature below the 1981-2010 average. The last time was 1996. That means that around 30% of people alive today have never experienced a year where globally it was colder than the most recent three decade average. For older readers who are as familiar with the period 1961-90, it's twenty eight (28) years since there was a year with an average global temperature below the 1961-90 average. The last time was 1985 - and that was only 0.01 degrees below. The second last time was 1978, a whole 35 years ago. So almost half the people alive today have never in their lives experienced a year where the global surface temperature was colder than the 1961-90 average. 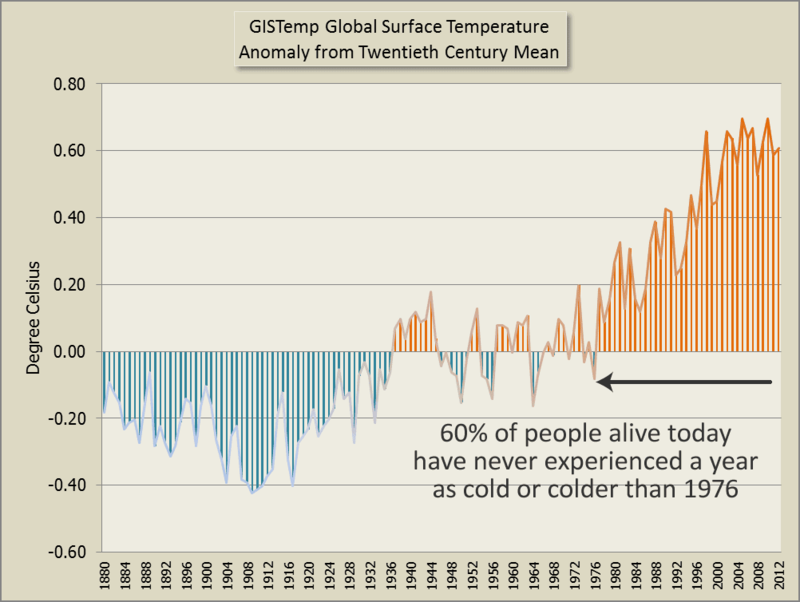 Almost 60% of people alive today would barely have noticed, since 1985 was only 0.01 degrees colder than the average. What about last century as a whole? The last time the annual global surface temperature was below the twentieth century average was 1976. That's 37 years ago. So around 60% of people alive today have never in their lives experienced a year cooler than the average of the twentieth century. Update: Go here for the update. I think the issue with the February 1985 versus December 1984 is that the press release was poorly written. I believe that they meant below the average for the entire period (1880-2013). This average is 0.0234 so February 1985 does seem to be the last date below this average. However, they do say this just after talking about the 20th century average, so it is a little unclear. One would like to think that this is really a minor issue (as you say) but, obviously, those at WUWT like to pick at any little thing that they can. Sorry that last bit (the anomaly game) went totally over my head, as my head starts to spin any time I see more than a couple numbers in a sentence. Can you explain the thrust of it? I'll try. Bob Tisdale wants to hide the fact that the world has been getting a whole lot warmer. The way he does this is to look at how much it's warmed only since very recent years, instead of looking at the whole time since there were enough thermometers around the world to measure temperature. Basically he wants to hide the fact that it got a whole lot warmer over the twentieth century. Think of a measuring jug that has marks on the side for different volumes of water (like is used for cooking). Let's say it's a two litre jug (or two gallons if you live in the USA.) Put some water in the jug but only a little bit. Only put enough so that it just touches the mark that closest to the bottom of the measuring jug. Then see how much more water you have to add to fill the jug to the top. It's a lot. What Bob wants you to do instead is first fill the jug to the top marker and that way he can say you only need to add a very small amount of water to fill the jug to the brim. That way he can say it's not a lot. What I did with the human population of different years is work out how many people who are alive today have ever experienced the climate of last century. Even if you think about the average global temperature for a recent period - the 1961 to 1990 average, which most recent year is only 23 years ago - you'll find that almost half of everyone alive today have never in their lives lived in a year colder than the average. That's not colder than the coldest year since 1961. That's colder than the average temperature for the years from 1961 to 1990. It's just another way of thinking about how quickly we have changed the climate of earth. It's probably never happened before barring maybe an asteroid strike. Being thick and deceptive is a virtue if you purpose is to mislead, deliberately or otherwise "Last month, I presented a post here about the impacts of base years on the presentation of global surface temperature anomalies. I used 1979 as the start year. It’s a commonly used start year because the satellite era of global temperature products starts then. See full story here Last month, I presented a post here about the impacts of base years on the presentation of global surface temperature anomalies. I used 1979 as the start year. It’s a commonly used start year because the satellite era of global temperature products starts then. Ummm... I think something got messed up in Anonymous' comment. Yes, Bob is being deceitful. He is wanting to hide the fact that it's been 37 years since there was a June that was cooler than any June in the entire twentieth century. How cold do you want it and why? How cold do I want it? If it's not too late already, I'd hope we can limit the heating to two degrees and no more. But that's probably wishful thinking. Why? To limit the extent and speed of melting ice sheets so that sea level rise will be limited and slowed - in turn so that as few tens of millions of people as possible have to be relocated; and those that do have more time to plan for it - ideally centuries rather than decades. To limit the number and extent of droughts and heat waves and wildfires and flash floods in particular. So that farmers can raise animals and grow crops without more losses than necessary to unpredictable weather and extreme weather events. So that oceans don't get too acid for all the marine life. And that fishers can continue to fish. To hopefully limit the extent of this sixth major extinction event. To hopefully allow civilisation to go on for thousands more years while limiting pain and suffering. There are more reasons - more philosophical. To do with responsible stewardship of the earth and all the life it contains. We are failing badly in that regard. Right, so why do you want temperatures to be lower than they were in The Medieval Warm Period, Roman Warm Period, Minoan Warm Period and Holocene Climatic Optimium? All of which were highly likely or definately warmer than the current era, all of which saw humanity increase in number as warmer weather and longer growing seasons lead to more benign conditions. There's been no increase in the number of flash floods, droughts or heatwaves, I note you omit hurricanes/cyclones, which is a good job, as Global Accumulated Cyclone Energy is at record lows, how about Antarctic Sea Ice being at record high? The Arctic Sea Ice levels has staged a dramatic recovery this year, a year where temperatures north of 80 degrees north have been at historic lows. Sea levels continue there monotonic rise of a few mm/year and, of course, despite rising CO2 levels, we've seen global temps plateau for over 15 years, sufficiciently long to falsify global climate models at the 98% level. Seas aren't going to "acidify", they're highly basic and pH levels vary considerably across them anyway. Since you've failed to realise it, it's cold that kills humans. Your "limit" of 2C is a figure pulled out of thin air. Also, 2C rise over what baseline level in which year? Anyhow, you'll doubtless be celebrating the lack of adverse climatic events and the regrowth of Arctic ice, let alone the recent peer revued papers that show climate sensitivity to be less than 2. My oh my. I haven't seen such a gish gallop in a long time. I won't bother asking you to provide sources for your extraordinary claims. They are not scientific sources. Probably a science rejecting blog or several. If you aren't scientifically literate (as seems the case), skepticalscience.com is a great source of information about climate science. Even if you think you can understand some science it's a good place and has lots of references to scientific papers. The latest IPCC WG1 report summarises the science to 2007. If you prefer your disinformation sources, then there will be no hope of you ever understanding earth's climate and earth systems past, present or future. Global Warming Denial Bingo, anyone? Of course, the "dramatic recover" means to the levels of the later half of the previous decade, and the "historic lows" probably just refers to the month of June, ignoring the equally historic highs in March and April. Yes, I am scientifically literate, having an Honours Degree in Chemistry. I've also spent many years in Pharmaceutical sales, so am very used to reading clinical papers (Where hard science is used). Your degree is in what? Skeptical Science is anything but, it's just a propaganda site. OK, references, I did assume that you knew of these, but if SS is your sole source, probably not. Here's an interesting blog post. The paper on falsification of climate models is paywalled, but Dr Curry's blog has a synopsis of it. You've still not said what baseline year & temp your 2C warming over is measured against. This does seem to be a common failing. The usual clueless contrarian grab-bag of nonsense, in large part gleaned from disinformer blogs. Same s***, different day. Doesn't really merit a response. Quoting quackery and pseudoscience! Hockeyschtick, 'stevengoddard', SPPI? They are rubbish! Skepticalscience is propaganda? I expect you regard Nature, Science, Journal of Climate, GRL, PNAS, Royal Soc Proc etc "propaganda" as well. That is typical of the sources that skepticalscience draws upon, not "publishers" that favour potty peers from Brenchley! You think if ice extent in the Arctic isn't the lowest on record it's recovering? And you know nothing of the Antarctic, or paleoclimate. HotWhopper favours mainstream science in respected publications - not just cherrypicked papers that say what a science denier wants to hear. I doubt you've ever read a scientific paper let alone understood it. I also have to doubt your honours degree in chemistry. If you did get one, it has done you no good at all in regard to being able to read and evaluate science relating to climate. Nor in being willing to read more widely - beyond the offerings of a couple of anti-science blogs. Stick to selling aspros is my suggestion. PS The sources anonymous quotes prove he or she is not scientifically literate, nor statistically literate, nor have they read M&M or its rebuttals. Nor have they read any paleoclimate literature. It's like something straight off the pages of Jo Nova or WUWT or an obscure blog claiming an ice age cometh any day now. A Honours degree does not make someone scientifically literature, even if it is in one of the hard sciences. The sources given by our anonymous gish-galloper show ample evidence of such. What scientifically literate person would use blogs and thinktanks as their "credible references", rather than the scientific literature? And what scientifically literate person would not have checked whether M&M ever had something published together, and what that work referred to? That scientifically literate person would have noticed that while they managed a few papers on one of the Mann et al reconstructions (and being soundly rebutted by Wahl & Ammann), they never ever published a single paper that challenged any of the Briffa or Jones reconstructions. I would also expect a scientifically literate person to note use a single year, but rather a trend, as his evidence when looking at Arctic ice cover. In short, and to repeat: you clearly lack the scientific literacy you claim to have. You should get your money back from your university, because clearly it failed. And a thanks to the autocorrect for transforming "literate" to "literature" in my first sentence. This rehashes a 2001 study by Hormes, Muller & Schluchter (sorry, no umlauts!) The Alps with little ice: evidence for eight Holocene phases of reduced glacier extent in the Central Swiss Alps. Well, no surprise there, really. Precessional forcing resulted in increased summer NH insolation that has steadily fallen from its early Holocene (~10Ka) peak to the present minimum value. So pointing to Alpine glacial variability *in the past* and suggesting that it tells us something about modern glacial recession is risky! Anonymous would benefit from this link from Catmando in another thread. And from reading more of the literature, rather than relying on denier blogs for his "science". OK, so the 1880s were a halcyon decade, when temperatures were just right? Let's look at a few records to see why? data up to 2008, I assume there's been little change since then, as global temps have been flatlined for the past 15 years or so. Well, England's not the world, so where else can we go with long instumental records? Lot of movement there, certainly warmer than the 1880s. Life must be hell for those Norsemen! Interesting changes, look like step changes in the early 1920s, late 60's & early 80s. Northern Norway, yup, warmer than the 1880s, interestingly seems to be less warm than the 1930s. Let's go south, get a bit warmer, I generally prefer to go somewhere warmer for my summer holidays. Funny that. Touch warmer now than the 1880s, but looks like the early 1940s take the record. Let's go far south, Australia! Been hot there, fires, floods & what have you. That's odd, you'd think it's now cooler than the 1880s, peak heat in the first quarter of the 20th Century! Maybe an oddity? How about Cape Town? Well, well, it was warmer in the 1880s! Peak heat in the second quarter of the 20th Century. How about that North America place? Hmm, a bit all over the place there! Big swings all over the place, I wouldn't like to make any statements about that data. Warmer now than the 1880s, but then again every decade in the record was! Maybe a little warmer now? Looks like 1900 was the hottest year there! Not many other places with long records, let's look at China. Interesting, that increase from the early 1960s onwards.UHI anyone? Well, I can't see why you feel the 1880s were such a perfect era (teperaturewise). Now here's your mission, overlay global CO2 levels on these charts & show a correlation! A bit of background to the silly and long list of links to poor old Tony Brown's wonderings, courtesy of Anonymous, because I don't blame any reader being perplexed. And it will save you wading through the thread. Anonymous wrote: "How cold do you want it and why?" I replied: "How cold do I want it? If it's not too late already, I'd hope we can limit the heating to two degrees and no more. But that's probably wishful thinking." 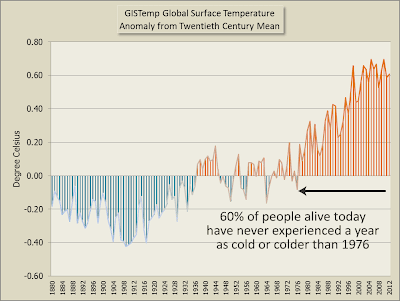 "You've still not said what baseline year & temp your 2C warming over is measured against. This does seem to be a common failing." I answered: "(If you want me to pick a period - say, 2 degrees over the 1880s. We're nearly half way there already - about 0.8 degrees above. )" Anonymous appears, mysteriously, to have translated my responses into: "Sou said the 1880s had the perfect average global temperature." Or maybe Anonymous translated it into something else. Whatever, Anonymous didn't translate it into what was clearly stated. Neither has Anonymous taken any notice of this link provided earlier. I doubt he or she will take any notice of this, either - about how Central England is a small spot on a small island in the North Atlantic. There's a lesson in that article for all the locations that Anonymous lists. Sadly, anonymous is overly verbose yet grossly unskilled when it comes to climate science - and apparently unaware of it. Sadly, too, anonymous hasn't yet learned to post threaded comments. I think Anonymous is probably just wanting a bit of attention. Not this again. CET data before 1772 are not considered reliable. Manley (1953) published a time series of monthly mean temperatures representative of central England for 1698-1952, followed (Manley 1974) by an extended and revised series for 1659-1973. Up to 1814 his data are based mainly on overlapping sequences of observations from a variety of carefully chosen and documented locations. Up to 1722, available instrumental records fail to overlap and Manley needs to use non-instrumental series for Utrecht compiled by Labrijn (1945), in order to mate the monthly central England temperature (CET) series complete. Between 1723 and the 1760s there are no gaps in the composite instrumental record, but the observations generally were taken in unheated rooms rather than with a truly outdoor exposure. Manley (1952) used a few outdoor temperatures, observations of snow or sleet, and likely temperatures given the wind direction, to establish relationships between the unheated room and outdoor temperatures: these relationships were used to adjust the monthly unheated room data. Daily temperatures in unheated rooms are, however, not not reliably convertible to daily outdoor values, because of the slow thermal response of the rooms. For this reason, no daily series truly representative of CET can begin before about 1770. In this paper we present a daily CET series from 1772 to the present.